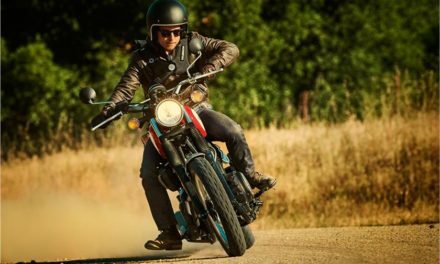 While the Ducati marketing machine were aiming the Scrambler directly at the Hipster, according my Ducati dealer most of the sales have gone to born again bikers. It seems the retro naked look has persuaded more than a few thirty and forty somethings back into the saddle and surely that’s a good thing! Whatever your reasons for being tempted to buy a Ducati Scrambler, you’ll likely follow the path of reading plenty of bike magazine reviews and watching bike tests on YouTube before committing to making a visit to your nearest Ducati showroom to see it in the flesh. The trouble with bike reviews is that the reviewer tends to have his or her arms tied behind his back. The Editor needs good reviews to keep the advertising revenue ticking over so you may not be getting the full picture. For a case in point take the Yamaha XSR700, a great looking retro that made more than a few waves when it was launched. Bike magazine had it for a long term 3 month review over the winter. They mentioned in passing that fur was visible within days of using it to commute through the streets of London and that rust came through shortly after. This was brushed under the carpet by asking why you would want to ride a bike like the XSR700 in the wet anyway! While Motorcycle magazine reviews are a great starting point you need to dig a bit deeper for some real insights into a bike you might be spending your hard earned money on. Here’s a couple of the best Ducati Scrambler video reviews I found while considering buying a Scrambler. Bennie Hitchcock takes his Ducati Icon for a blast through the famous Cheddar Gorge. This is the perfect example of how you can learn far more from watching and listening to a genuine owner happy to share his insights rather than from a professional who’s only got the bike for a few hours. The Colorado Rockies no less! While Ducati say that just like it’s predecessors, the Scrambler is not an Enduro, there are plenty of videos of owners prepared to push the Scrambler off road to see just what it can take. The result? Well, this lunatic brave owner managed to climb 13,000ft, fell off twice but managed somehow to get away with nothing more than a broken kill switch – not a scratch on the tank. Thanks Jeremy for showing potential owners that they really should stick to roads. Yamaha SCR950 Scrambler – Genuine Off Roader? Where did you get the Saddle and Tank Panel?